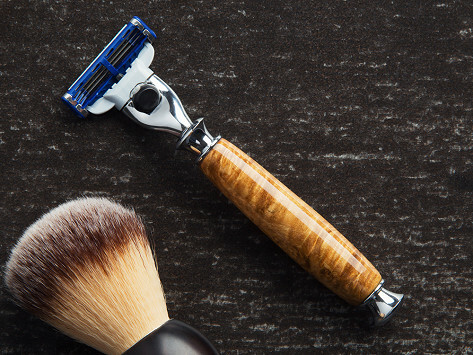 Make your daily shave more special with a wooden razor handle that’s handcrafted in the USA and guaranteed to last a lifetime. The handle works with most popular razors, and is made from sustainably grown and harvested wood. Finished with chrome accents, the result is a striking and useful piece you’ll want to reach for every day. Dimensions: 5" x 1" x 1"
Only problem I am finding with this razor is that when I go to shake the razor dry, the blade will easily come off. Imperium Shaving handcrafts wooden razor handles that beautifully elevate the everyday routine of shaving. Maker Dan Janssen believes in making daily rituals more special, and these hand-turned, carefully crafted handles certainly do just that. And, because the handles work with most popular razors, you don’t have to alter your routine to make it look better. The handles and razor stands are all made in Dan’s studio located in a historic mill building in Maryland. He starts with sustainably grown and harvested wood—like rose, tiger, and olive—that he then hand-turns and finishes with a mix of modern machines and traditional tools. The result is an attractive piece that looks great and functions well, and that is guaranteed to last a lifetime.